Then everywhere I looked: feathers. One of my favorite tiny poems, a poem I discovered at Words Without Borders, goes like this. I like the idea that a feather might be a gift from the moon. August was night dancing under the moon with my husband. And laughing. 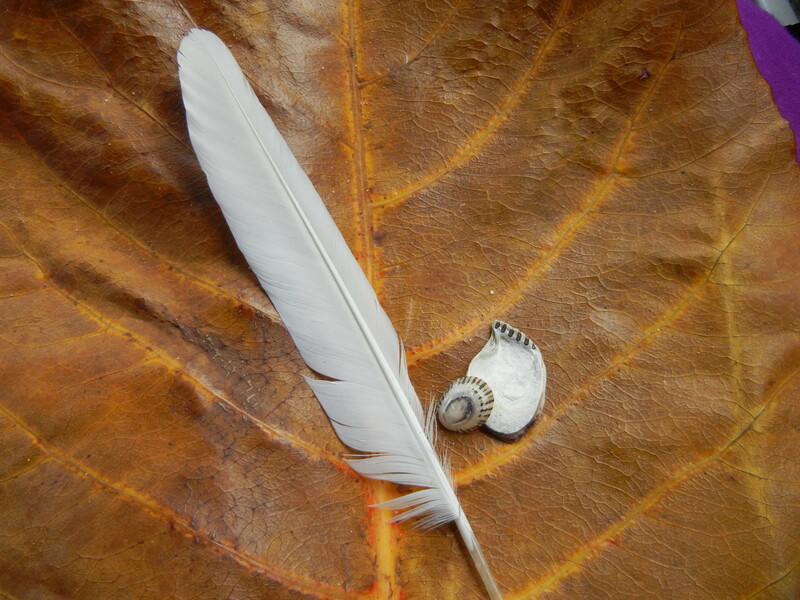 And feathers and shells and reflecting on my whiteness against a backdrop of darker skin. August was making a daily practice of finding a poem in each day. August was bare feet and figs, jazz and learning to wait for peaches to ripen. Did you you honor the gifts of August? For more “August was…” images, check out The August Break, 2015, a community project curated by Susannah Conway, a photographer, author and teacher we greatly admire over here at Backyard Sisters. You can review the month-long photo challenge to “Live inside each moment,” by checking the more than 19,000 posts at #augustbreak2015 on Instagram, Facebook, and Flickr. This entry was posted in A Woman of Letters and tagged #augustbreak2015, by Catherine Keefe, feathers, Humberto Ak abal, inspiration, literature, poetry by backyardsisters. Bookmark the permalink.